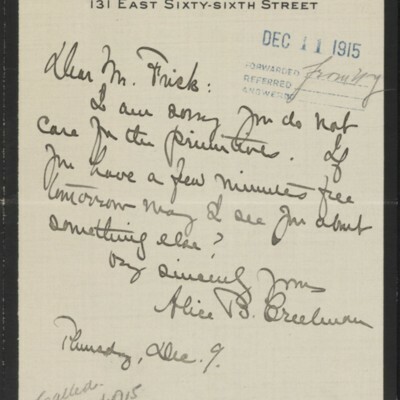 Creelman began corresponding with Frick after the death of her husband, jounalist James Creelman, in 1915. 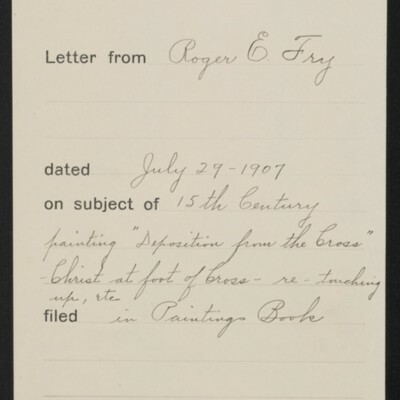 That year, she arranged for Frick to purchase two works (Holbein's Thomas Cromwell and Titian's Portrait of a Man in the Red Cap) from the collection of Sir Hugh Lane. 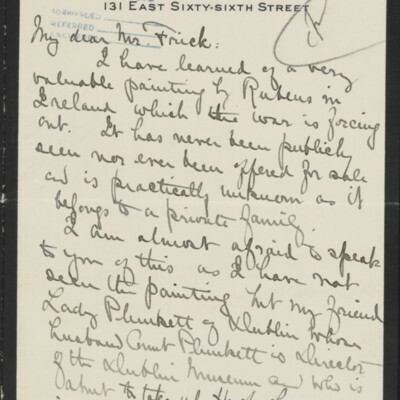 She later had a hand in Frick's acquisition of works by Whistler and Van Dyck, and offered him works by a number of other artists, including Roselius, Donatello, Fragonard, Giorgione, Rubens, Tiepolo, Whistler, Romney, Reynolds, and Vigée-Lebrun. 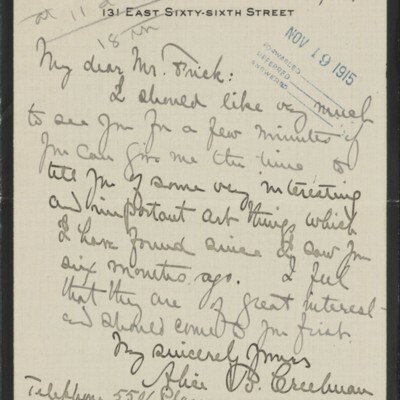 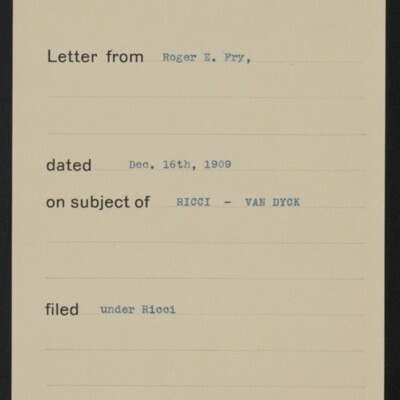 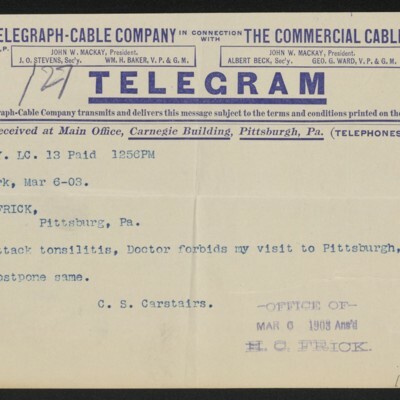 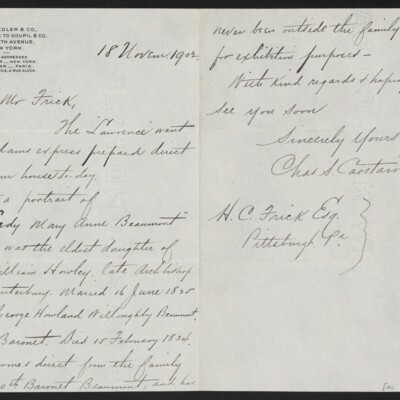 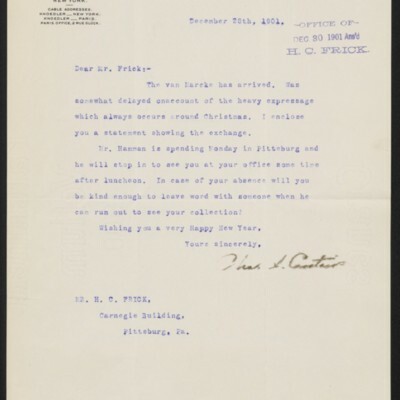 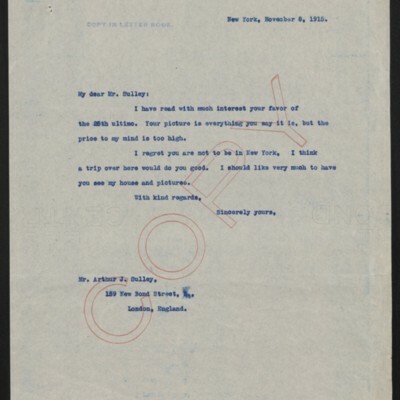 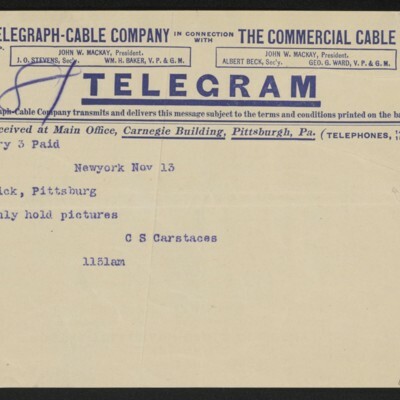 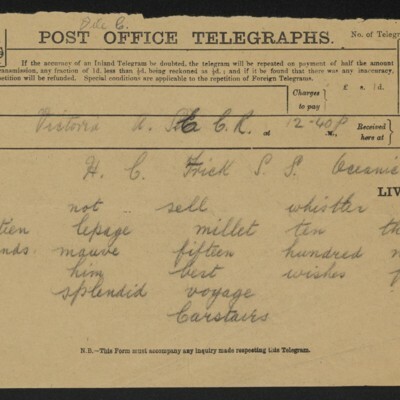 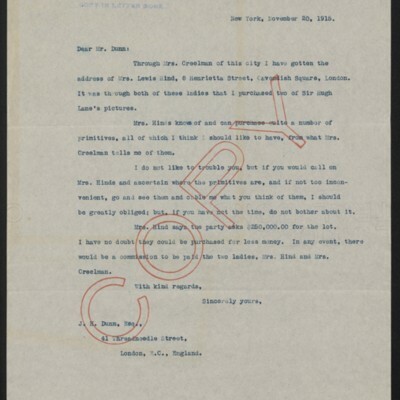 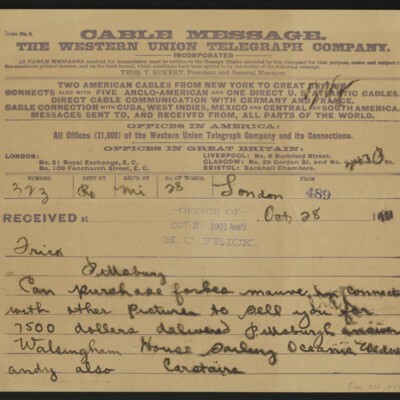 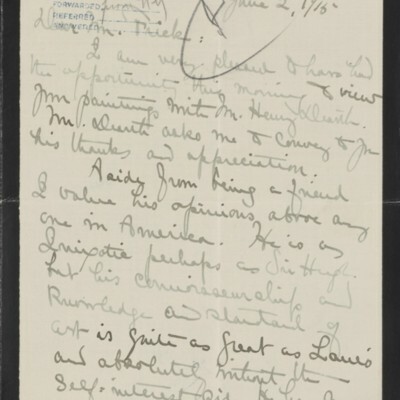 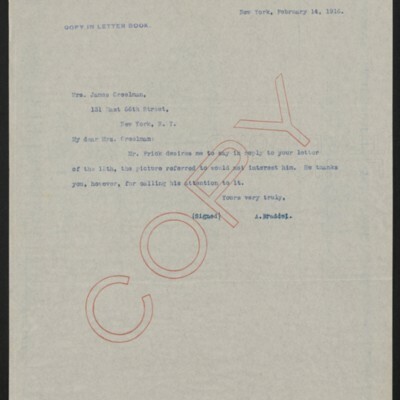 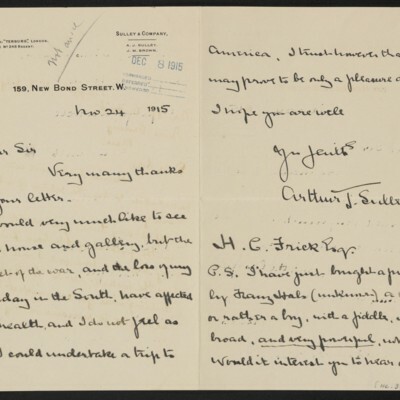 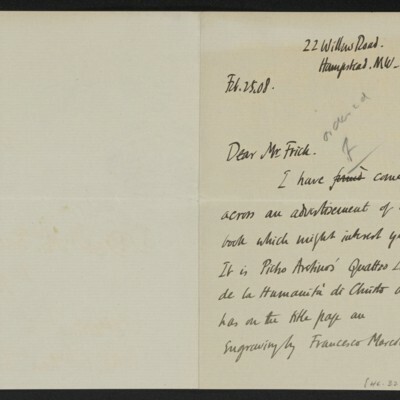 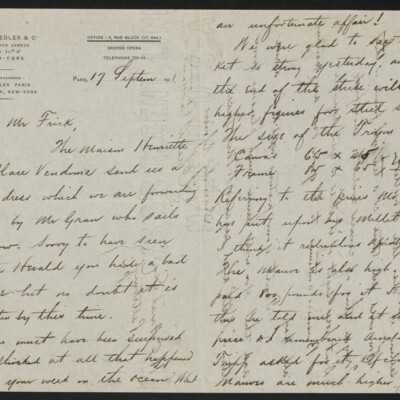 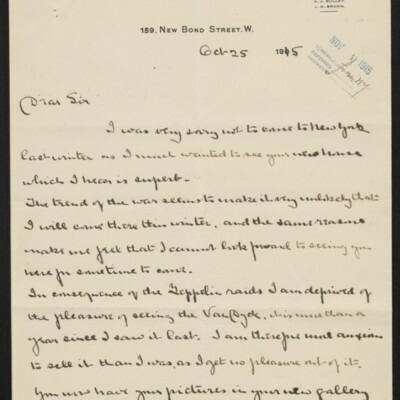 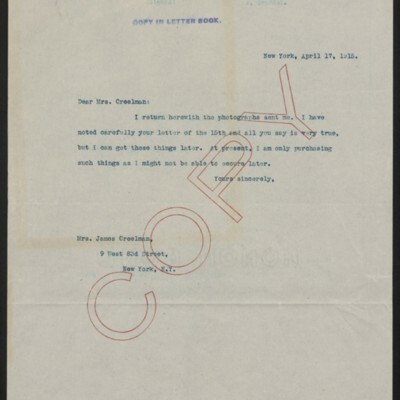 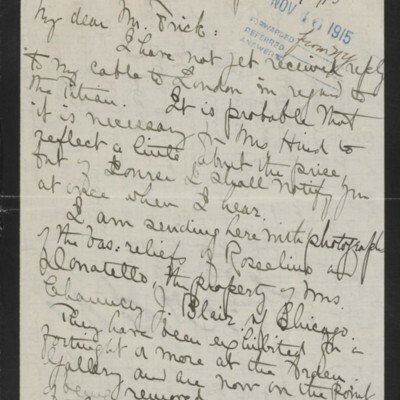 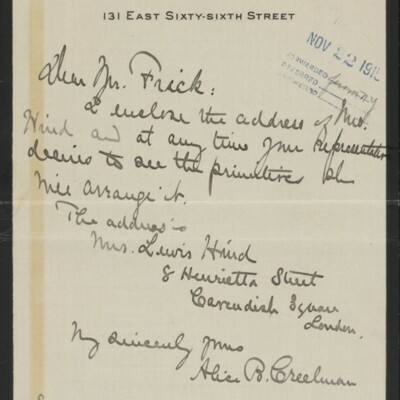 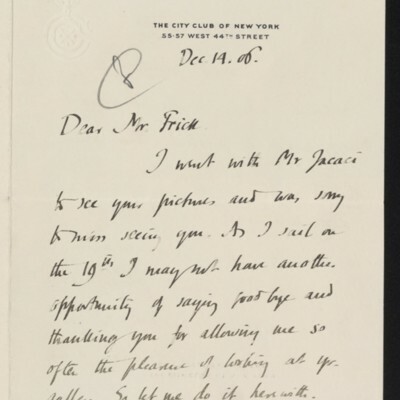 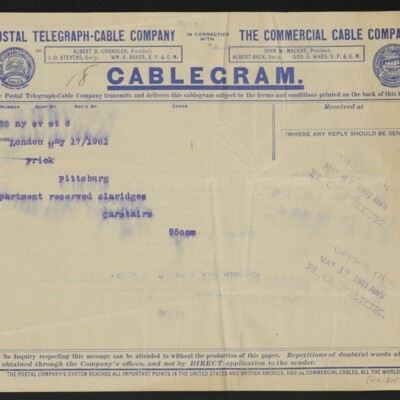 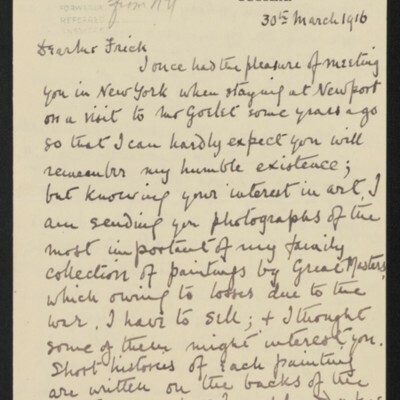 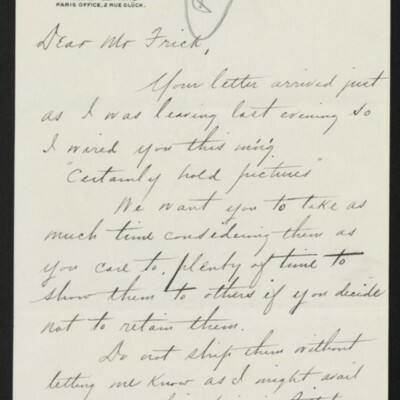 Frick's correspondence with Sulley dates from 1914 to 1915, and concerns works by Vermeer, Van Dyck, and Hals. 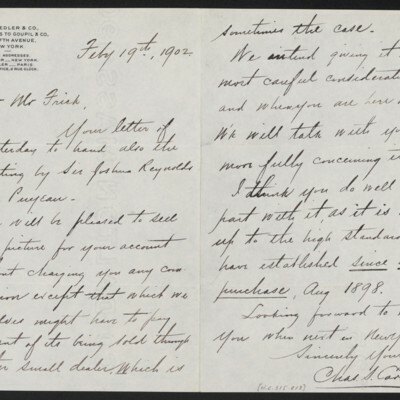 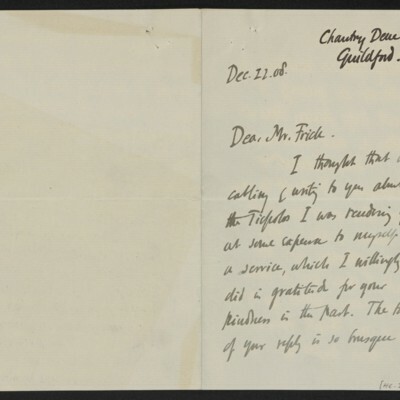 Clarke wrote to Frick in 1916 to offer several works from his family's collection, including examples by Hoppner, Romney, Reynolds, and Greuze. 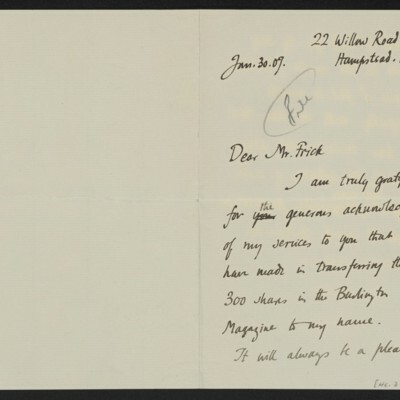 Frick replied to decline the offer. 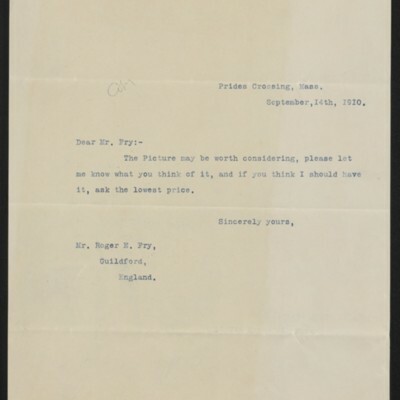 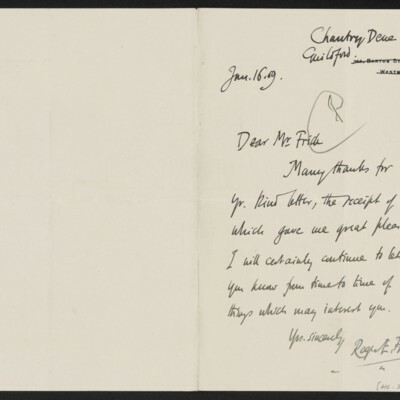 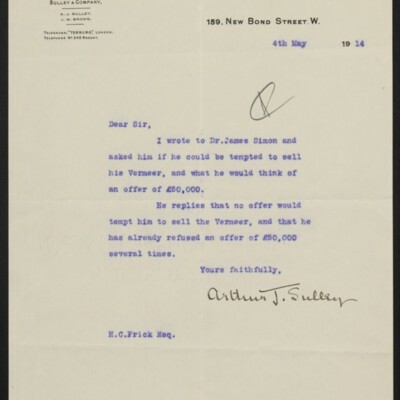 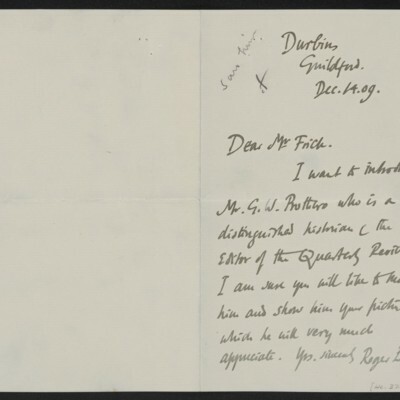 Frick corresponded with scholar, painter, and critic Roger E. Fry from 1906 until 1912. 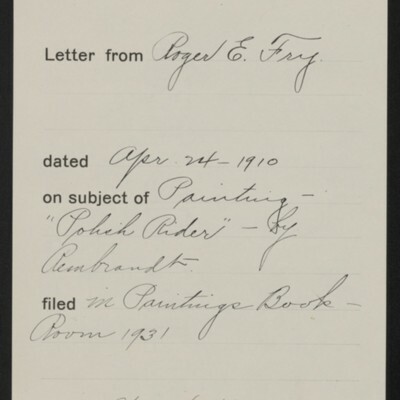 Fry occasionally acted as an advisor to Frick, and served as a purchase agent on works such as Rembrandt’s Polish Rider. 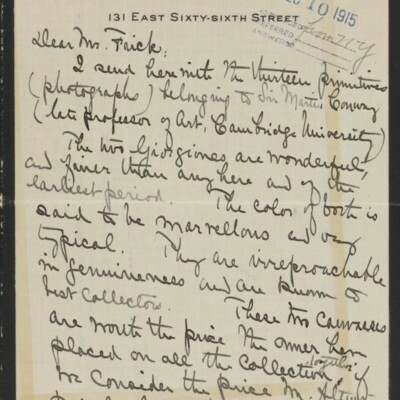 He also tried to interest Frick in purchasing other works, including ones by Titian, Tiepolo, Holbein, Vermeer, Tintoretto, Van Dyck, and Velázquez.